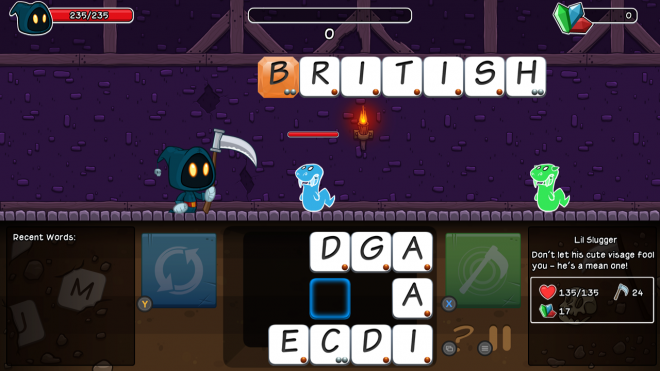 Developed by Canadian duo Bacon Bandit Games, 'Letter Quest: Grimm’s Journey' has players spelling words in order to strike blows against monsters in a turn-based RPG. The game was a PC and mobile release in the fall of 2014, but now a remastered version has arrived on the Xbox One and Steam. This is the story of Grimm, a darling little grim reaper who must battle his way through dungeons and haunted houses. I’m not exactly sure why he must do this, because he doesn’t really take lives so much as collect gems, so perhaps he is a rather greedy reaper. Anyways, to do battle he doesn’t use strength or magic, he uses letters. 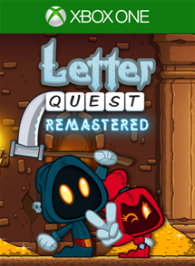 If there was ever a video game that encouraged the use of words over violence, 'Letter Quest: Grimm’s Journey Remastered' would be the one. In each dungeon, Grimm moves across a 2D setting, occasionally stopping to battle monsters, collect piles of jewels, or open treasure chests. Damage is inflicted on enemies by forming English words from a grid of letters on the bottom of the screen. Three letters is the minimum, and not very powerful - if your bread and butter is stuff like "pan", you’re going to have a rough time of it. The mother lode is in words like "homelands", "ricotta", and so on. The bigger the word, and the more uncommon letters that are in it (Z and X are worth a boatload), the more points are inflicted on the enemy. Think 'Scrabble' and you’ll get the idea. Thankfully, writing for High-Def Digest has garnered more than just limitless women and prestige - it has bestowed upon me incredible word powers with which to help Grimm smite his foes. I’m just kidding; spelling more and more words gets really hard. It's also really fun. 'Letter Quest' has nearly 200,000 words in its database (more than 'Words with Friends', I might add), running the gamut from pre-school to Oxford. Each one is accompanied by a dictionary-style definition to help kids of all ages learn new things. There are some provocative words, but they’re all "real", not just gratuitous cussing (they often have innocent definitions, though). Being a 12-year-old at heart, I love finding the naughty spellings as often as possible, which has the side effect of making it fun to play with other grown-ups helping. As Grimm moves through the levels, the mechanics become more complicated. Some letters are poisoned and spread their toxin to other letters each turn. Others are cracked and offer no points at all when used. Some are crystallized and offer bonus points. By completing objectives, I earned gems with which I could buy equipment upgrades, bonuses, a new character, consumable items, and other goodies. It turned from a challenging word puzzle game into a challenging RPG/word puzzle game, which is even better. Individual items earn experience and levels of their own, providing a level of strategy, and can be swapped out depending on the makeup of the next dungeon. In true dungeon crawler fashion, not every run is going to be successful. Monsters have oodles of health and require lots of big words to defeat, so unless you’re a savant or a shameless cheater using crossword helper sites (which are very convenient, but I would of course never use them), you’ll be going back to the drawing board sometimes to lick your wounds and plan another course of action, buy better gear, or whatever else little word reapers do between dungeons. There is no penalty for losing, though, so eventually you will be able to get past the tough ones and on to even bigger challenges. This version has been run through the Unity engine, giving it some improvements over its 2014 debut. Animations are better, the performance is smoother, and characters pop out with more detail. It’s still quite modest, but the cutesy art style is endearing. The remaster touts a new soundtrack, which isn’t bad for electronic fantasy game fare but tends to spiral into oblivion before too long. The sound effects are much the same, and there are no voices. 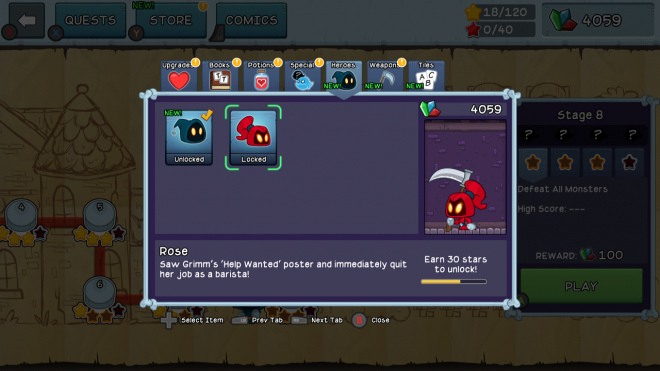 'Letter Quest: Grimm’s Journey Remastered's mobile pedigree is apparent with its bite-sized outings. A typical run lasts less than five minutes, and the time trials are even shorter. In spite of this, there is a huge amount of content for what is essentially a $10 mobile remaster (and mercifully, microtransactions are nowhere to be found). Each level can be replayed for additional gems and stars with different objectives tossed in, like the time trials, harder enemies, random rules (no words less than 5 letters, only one vowel, etc.). The core gameplay never really changes, but it also never really disappoints. There is an impressive selection of challenges, basically in-game achievements that give gems when completed. This edition also adds an endless mode for marathon gamers. I am pleasantly surprised that 'Letter Quest: Grimm’s Journey' has been (rather quietly) brought over to the Xbox in a remastered form. Yes, it is available on many other systems, including some that are easier to carry in my pocket, but it’s the kind of thing that can still be popular with family and friends despite being solely single-player. 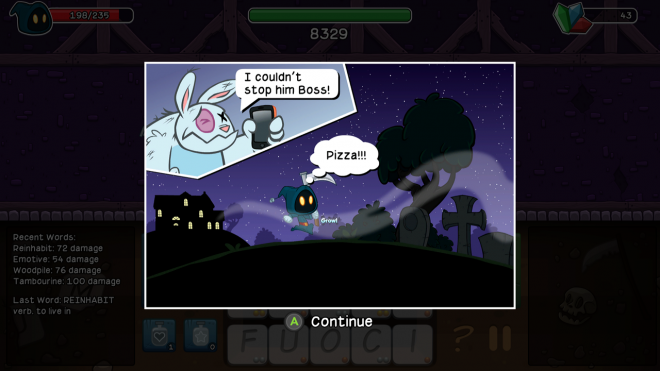 This is a tough and rewarding puzzle game, and its word/RPG combo is probably one of a kind.